Home > Aston Martin Racing, bathurst 12hr, Beechdean, Blancpain, British GT, Prodrive, R-Motorsport, RL, Testing, TF Sport, v12, v8 turbo, Vantage GT3, VLN > How long now before we see the new Vantage GT3 at its first competitive race? 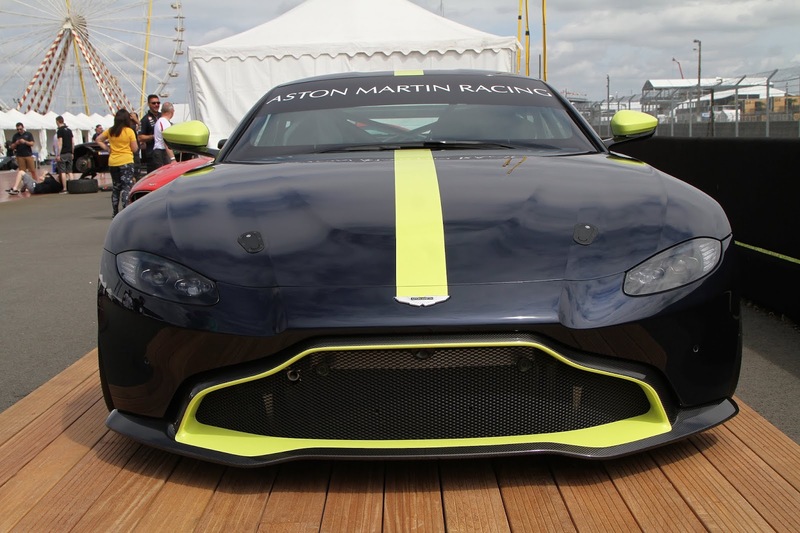 How long now before we see the new Vantage GT3 at its first competitive race? 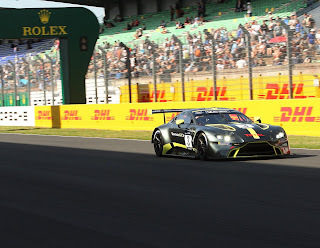 Catching up on an interesting snippet of information coming out of Spa Francorchamps at the weekend, it looks like Aston Martin Racing and their strategic partners are about to embark upon the final stretch of development testing with their new V8 turbo charged Vantage GT3 as the factory strives to make this new car available to their customer teams in time for the 2019 pre-season testing. Having already seen the new 'concept' car as they called it run to such great effect in its 'raw' state by Ross Gunn at the Aston Martin Racing Festival at the Le Mans 24Hr back in June, it has since been disclosed that R-Motorsport will be entering at least two examples of this new car in the two available classes at the Bathurst 12Hr event in Australia which kicks off in late January 2019. That of course does not leave much time in which to complete its development, homologate and then get the required numbers built for their wanting customer teams around the world. 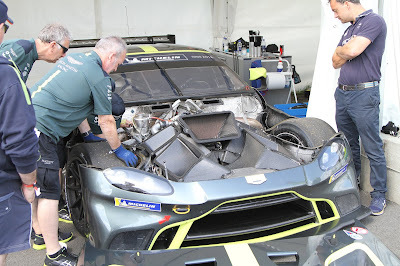 The car that we saw race at Le Mans was chassis #1, the new Vantage GT test and development car of the new turbo charged GT era but running with associated GT3 engine, suspension and running gear components (mainly ABS and traction control) and also running in an unrestricted format and with GTE aero. From conversations had we understand that the GT3 aero will certainly be less 'aggressive' than that of the GTE in its final state. Indeed, looking under the bonnet of the GT3 development car in the paddock at Le Mans there was little obvious differences between the two and we had to take the word of the technicians of the differences actually being there! The engine and turbos are essentially the same so it is understandable if the associated air channelling around the engine bay was also essentially the same - hence the immediate similarities. The public reveal of the new GT3 and GT4 platforms at Le Mans was also something of an understated affair with the full time sports car media attending the World Endurance Championship event not actually being aware of the new cars presence in France until such time at the GT3 actually hit the track in Free Practice for the support event and shots of the new GT4 in the support paddock were revealed on social media. Then, the teams new GTE was already known to be struggling with permitted performance for the 24hr race so just maybe this was all something of a last minute 'gesture' by the team to be able to 'demonstrate' what their platform was actually capable of if left alone as indeed it was actually faster than the GTE equivalent. Who know ........................!! With the venerable V12 iteration of GT3 well within its final year of top flight competition around the world (and still winning we might add) we understand that the volume of enquires to the factory about the new car has been unprecedented with potential sales already outstripping the volume of the platform it succeeds. Only recently has Prodrive advertised an intense recruitment drive for thirty odd trained technical staff to help with the fabrication and running of these new cars form their Banbury facility. With the new Vantage GT4 also being on display at Le Mans (although unfortunately only in a static format) it only makes sense to expect the final development of that car to follow a parallel path to its bigger GT3 brother at the same time as potential interest in that platform is apparently even higher! Straining our grey matter back to the time of the ADAC N24 from the Nordschleife back in May, we seem to recall that AMR President, David King suggested that such a new GT3 platform could see its first competitive races in its completed state in a VLN series race at the tail end of the 2018 season in either September and October. Aston Martin Racing have previously said that both cars would remain in development until their homologation are confirmed for competition from 1st March 2019 so it will interesting just how the R-Motorpsort announcement is permitted to operate. Where and when it actually appears we will have to wait and see! !